Quick & Easy Seafood Risotto - It's No-Stir and Brilliant! 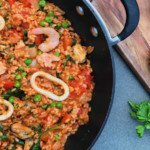 Quick & Easy Seafood Risotto - It's No-Stir and Brilliant! Thick, rich and creamy seafood risotto without any effort. You will never cook risotto the hard way again. Heat a large saucepan or frying pan with lid over a medium heat and add olive oil. While, the oil is heating roughly chop the onion and deseed and chop the capsicum. Sauté the onion, capsicum and garlic for 5 minutes, or until soft. Add the smokey paprika and rice and stir until fully coated. Next add the tinned tomatoes and chicken stock, stir and bring to the boil. Once the liquid has boiled reduce the heat, and simmer covered for 15 -20 minutes stirring occasionally. The risotto will be ready when the rice is tender and most of the liquid has been absorbed. Add the marinara mix, peas, spinach and parsley and stir through. Cook for 5 minutes or until all the ingredients are warmed through and the spinach has wilted. Season with salt and pepper and squeeze the juice of half a lemon over the top. Serve with the remaining lemon cut into wedges. You will get at least 3 serves out of this one, but if you’re cooking for a bigger family, double the ingredients. Don’t like seafood? No worries. Just switch the seafood for chorizo or shredded BBQ chicken from the supermarket or both – YUM!